Sometimes you have to leave a job you enjoy because you have another job and are unable to resolve a scheduling issue. When this happens, you want to be clear with your employer as to why you're resigning and underscore your positive experience with the company. 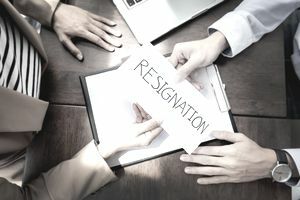 Use this resignation letter example to advise your employer that you are resigning because of a scheduling conflict with another position. This is an example of a resignation letter due to a schedule conflict. Download the resignation letter template (compatible with Google Docs and Word Online) or see below for more examples. Please accept this letter as my formal resignation from my waitress job at Mamma Mia’s Ristorante. I am resigning from my position due to an unavoidable scheduling conflict. As you know, I have worked at Mamma Mia’s evenings, and some weekends, in addition to working nine to five as a front desk receptionist at the Sarah Coleman Spa and Wellness Center. My hours at the office have changed and it has become extremely difficult for me to get from one job to the other without being late. As you know, I have two children under the age of five and I also have to pick my children up from school. Unfortunately, it is impossible for me to maintain this demanding lifestyle, so I am forced to leave my job at the restaurant. My last day will be July 15, 20XX. I want you to know that I very much enjoyed my experience at Mamma Mia’s and I thank you for giving me the opportunity. I will miss my coworkers and superiors, who have become like family to me. You have a beautiful establishment and I will always look back fondly on the past two years I spent in your employ. I sincerely apologize for any inconvenience my resignation may cause you and the rest of the staff. If you need any help finding a replacement, please let me know. I may be able to refer someone to you. Or, if you need me to pick up different shifts until my last day because you want to test my replacement, please do not hesitate to ask. Thank you for your understanding in this matter. I wish you continued success and I hope we can stay in touch. If you’re emailing your letter, here's how to send your email message, including what content to provide and the importance of proofreading your letter. You'll also find advice cautioning you to double-check everything to make sure you included all the necessary information and why you should always send a (test) message to yourself beforehand. It is after much thought and soul-searching that I have decided that I must submit this resignation to you. Working part-time at Yvonne’s Boutique Fashions has been both a pleasure and a wonderful opportunity for me to learn the ropes of retail sales. However, as you know, I have also been performing a management internship at T-mart as part of my college program. The program director has just changed our assigned shifts, which conflict with those I typically work at Yvonne’s. In the hope that this internship will translate into a full-time management role after graduation, I feel like it’s in my best interest to leave Yvonne’s in order to focus upon my internship. My last day of work will be two weeks from now, on Month, Day, 20XX. Thank you, so very much, for employing me three years ago and teaching me how to provide wonderful customer service to our clientele. The lessons I’ve learned about sales, personal communications, and merchandising have been invaluable. Please let me know if there is anything I can do to help make your search for my replacement go smoothly; I am more than happy to train them in my current responsibilities before I leave.